Evanston Police Chief Richard Eddington answers questions at an EPD community open house Monday night. Eddington said the city is in a “handcuffed position” while it goes through litigation with Lawrence Crosby. 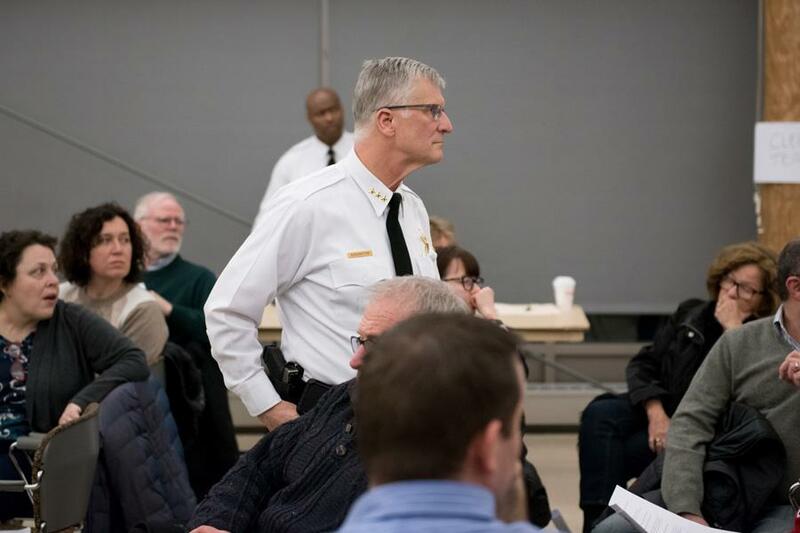 Community members voiced frustration with Evanston police officers over recent racially-charged police incidents at a department-hosted open house Monday evening. EPD held the open house at Levy Senior Center, 300 Dodge Ave, to address community concerns of racial bias among Evanston police. The event follows the release of a video showing the 2015 arrest of Northwestern graduate student Lawrence Crosby. In the video, Crosby, who is black, is shown being thrown to the ground as officers kick and punch him. Following its release by the city on Jan. 12, the video has sparked debate over police conduct in Evanston. Police Chief Richard Eddington said during the open house he believed officers applied the necessary amount of force in the incident based on what they knew at the time. He said that the city is in a “handcuffed position” while dealing with pending litigation. Evanston resident Melissa Blount told The Daily she was uncomfortable with Eddington’s emphasis on minimizing the potential financial damage to the city as opposed to focusing on how officers engage and interact with citizens. Blount added she felt Eddington was trying to lessen the impact that race had in Crosby’s arrest by emphasizing the diversity of the police force. “Basically what (Eddington) is saying (is), ‘Our department can’t be racist because I have black folks and Hispanic people and Muslims on the police force.’ It’s like no, what’s the tone, what’s the political and social climate in which these people live and function?” Blount said. Eddington also said during the open house that the Crosby case resulted in changes in departmental procedure. He pointed to the case of city clerk candidate Devon Reid, who was arrested in November while petitioning to run for office, as an example of how incidents are resolved more quickly now than they were before Crosby’s arrest. Reid said his experience shouldn’t be used as an example of the system working correctly. Officer Sophia Syed, a procedural justice and de-escalation instructor for EPD, said the department is trying to improve relationships by integrating itself in the community. In the next two weeks, EPD will be rolling out department-wide mandatory training on procedural justice, de-escalation and implicit bias, she said. In order for crime to be prevented, the police department needs to have an open dialogue with the community, she said. Eddington said that to assume that EPD could police a free and democratic society without any errors is an unrealistic expectation. Being a police officer is “a complex (and) hazardous job,” Eddington said, and it’s important to recognize the good work being done.